The most underrated, inexpensive cleaning tool at your disposal? Microfiber cloths. I hear the scoffs at microfiber. Many of you know that the cloths sold in the cleaning aisle at the grocer aren't cheap. However, if you shop at a department store for groceries and slide to the automotive section you can get a huge bag of "auto cloths" for dollars. They are the same thing. What a convenience rip off, right? I bought this 12 pack for five dollars. This pack happens to be an assortment of green, blue and hunter orange. I thought I wouldn't use the neon orange ones but they turned out to be my favorite. They are so bright they are hard to misplace - an excellent feature when using them to dust the house. Here are some ways you can use these miracle cloths. Smartphones, tablets, or any electronic that gets smudges. No cleaning solution needed. I took one of the cloths and cut it into smaller pieces to travel in my purse and car. Windows. If you have one of those popular two story great rooms with the big windows, you probably hate window cleaning. Me, too. Windex makes an outdoor cleaning kit for windows with a wand and a velcro pad. I bring the wand indoors and throw a microfiber cloth on the velcro. Spritz with cleaner as needed and toss in the wash when finished (no fabric softener, just suds). Dusting. This one is a no brainer. For quick cleaning it can remove the dust without you inhaling chemical laden polish. Bathroom countertops. Use your favorite cleaner and toss them in the laundry (no fabric softener). Eye glasses. These are the best eyeglass smudge removers available. No cleaner needed. Dry erase board. If you left writing on your dry erase board and it doesn't want to come off, try spritzing a cloth with the cleaner. And as an eraser in general, I find they work better that the dry erasers. Drying hair. 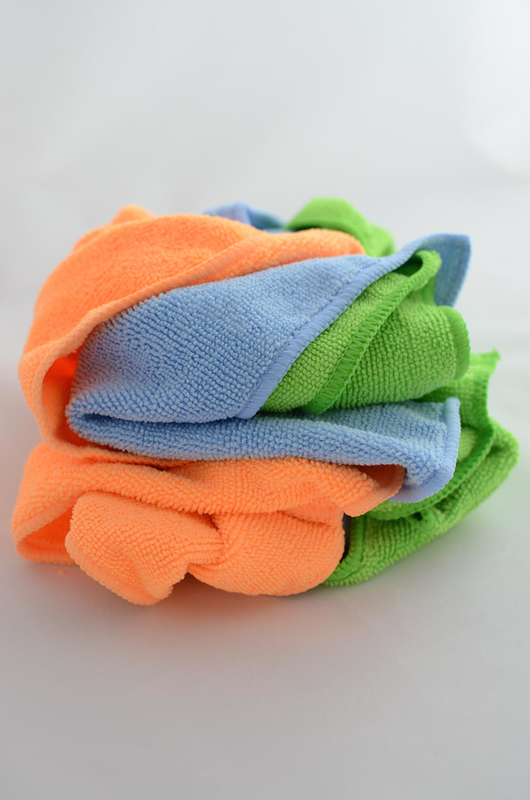 If you have frizzy hair or hair that takes a long time to dry, ditch the terry towel and try microfiber. When you get out of the shower, grab microfiber and rub straight down for smooth hair, or blot for curly/wavy hair. Be gentle to avoid frizz. This will cut your drying time and reduce fuzz. So if you read the entire post, you'll know what I'm about to say but it bears repeating...absolutely never use fabric softener on these cloths while in the laundry. It coats them with a film that smudges everything. And that defeats the purpose. Microfiber cloths...cheap, reusable, and super effective.